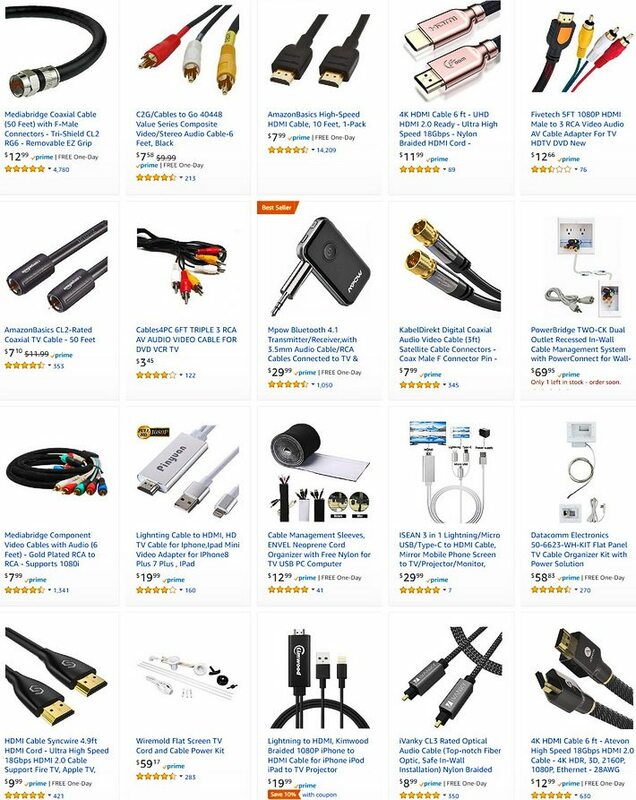 What Types Of TV Cables Are On The Back Of Your Television And What Do They Do? Quick guide on the most common types of TV wires, to help you setup your TV quickly and get the best possible picture and audio quality. Different types of TV wires and cables. Back in the day, televisions had a spot to connect an antenna, and that was all. There were no complicated wires to deal with, or trying to figure out which wires you needed. With today’s modern HD televisions, when you look at the back or sides, you’ll likely notice many connections where different types of cables can plug in. How do you know which ones you need, or which ones will work best? We will explain all that below. Component video cables/wires are easy to identify, as they are three separate wires – one Red, one Blue, and one Green. Each one of these sends the corresponding color signal to the TV, providing a sharp and clear picture. Most newer TVs offer a spot to plug in component wires – look for 3 holes in the TV that match up with the colors of the wires, all in a row. Much like the Component video cables/wires, RCA or RYW cables/wires are actually three different wires bundled into one. The difference is that these wires come in Red, Yellow and White, rather than Red, Green and Blue. Also known as RCA cables, or component cables, these wires transmit not only a video signal (on the yellow wire) but also left and right audio (on the red and white wires). These are an older technology, and are not typically used in newer TVs. Also known as Super Video, this wire transmits a video signal from a device to your television. It’s an upgrade from Component video wires, and provides pretty good picture quality. If your television as an input for S-Video, but not offering HDMI, this is the way to go. Keep in mind that S-Video only transmits video, and you’ll need another wire for audio. The most common cables/wires now used on HDTVs is the HDMI wire. An HDMI wire allows you to transmit high-definition video and audio from a device to a television, allowing you to use only one wire for the job as it transmits video and audio. It also has the highest capacity, meaning there is less signal loss, and therefore a higher quality. HDMI wires have a trapezoid-like shape on each end, with tiny pins inside that connect to the device and the television. HDMI means = High-Definition Multimedia Interface. as HDMI. If you can’t use HDMI, or if you have some other reason for needing a dedicated audio signal, try to use a Digital Audio Cable. You can also use a Digital Optical Audio Cable for a soundbar or a surround sound system as they produce the best sound quality. If you plan on watching live television, you’re going to need a signal from somewhere. For cable owners, this signal typically comes through a Coax cable. This cable runs from outside the house, straight into your cable box. It is typically capable of handling a large amount of information, so you don’t have to worry about signal quality. Finally, if you are instead getting your channels through the airwaves, you’ll need to connect an antenna. Look on the back of your television, or the manual, and see if your television is capable of accepting an antenna signal. If so, look for the label identifying this port, and you can plug your antenna right in. There are sometimes so many wires behind a TV that it becomes overwhelming. Here is a good way to keep your TV wires organized and hidden. By learning what the different wires do, and which ones you actually need, you can make sense of the chaos and deliver yourself the best possible setup. Hopefully this guide was able to shed some light on the different types of cable wires you might encounter. NOTE: These types of wires are used for streaming devices such as Netflix, ROKU, Xbox, Playstation, and more streaming media devices. Here are some great Android TV Boxes that work with mostly HDMI cables here… Android Smart TV Boxes – Free Movies! If you would like to learn more, or if you have any questions, please feel free to contact us at any time by using the comments form below. I need to connect my vcr to tv. my vcr has rca or component outlets. my tv which has hdmi. what can I do. do they make an adapter. Previous post: Troubleshooting Your Refrigerator Compressor – Is Your Refrigerator Running?